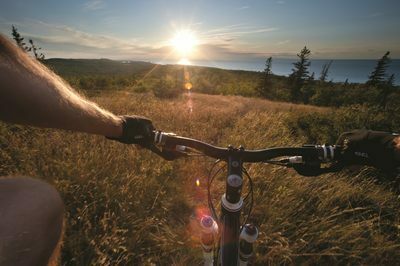 If you like to bike, there is no place in Michigan more scenic, more varied in its terrain or more thrilling in its races than the Upper Peninsula. In addition to the trails listed here, there are thousands of miles of logging roads, abandoned railroad grades, state and national forest trails, single tracks, off-season cross country ski trails and low-traffic highways that welcome lone riders to tour groups. Our accolades include Houghton and Marquette making the list of top Bicycle Friendly Communities in the nation by the League of American Bicyclists. Copper Harbor Trails are designated a Silver Level Ride Center by the International Mountain Bicycling Association ― one of 10 trails in the world to earn this coveted ranking! We are a four-season bicyclists’ paradise if you straddle fat tired bikes in our snow from late fall to early spring. Families can cycle along the shores of three Great Lakes, around historic islands or down wooded trails in our warmer months. Friends can pedal to roaring waterfalls and glistening lighthouses. And competitors can accept the often merciless challenges that our epicenters of mountain biking, Keweenaw Peninsula, Marquette and the Porcupine Mountains, deliver. Choose your level, there are hundreds more miles to explore after today’s ride.